Where do you go when you need to produce copies fast without sacrificing the quality of your black-and-white text and images? 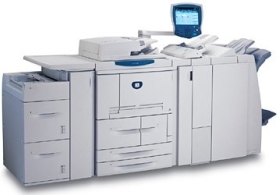 At Watson Printing, we have the right equipment and the best people to handle your manual, booklet, brochure or flyer. Our Xerox black-and-white copiers produce exceptional images at a lightning-fast rate of 110 pages per minute. When printed from your electronic files, the true blacks and grayscale capabilities yield images of near-photographic quality. In fact, our equipment includes a photo setting, which delivers remarkable second-generation copies of your favorite black-and-white photos and documents. Need to make a booklet or manual for an upcoming presentation? Watson Printing has the know-how and the machinery to get the job done right and on time. We also offer bindery services to saddle-stitch, wire, spiral or GBC bind your presentations. Typical clients include elementary and high schools, colleges and universities, golf clubs, service organizations, alumni committees, venture capital companies and businesses that need to produce quarterly and annual reports. This is one of our most commonly-requested services. Whether you need an existing binder copied or if you need to have us make multiple binders from scratch, you’ve come to the right place. We can quickly create binders with impressive black-and-white (or color) images that will make an impact on your clients and employees. Tired of boring numbered tabs? No problem. We customize each mylar-coated tab to your exact specifications. Call us at 781-237-1336 for more information or email your files to get started.